Japan is full of characters, both modern and traditional, but I think some of the cutest little creatures in Japan are shisa. 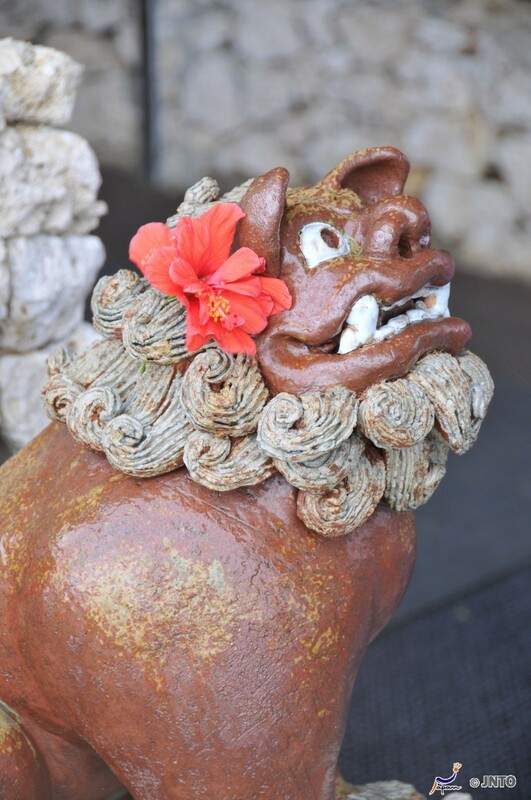 Although you will find shisa on mainland Japan (often called ‘guardian dogs’), they are most commonly found in Okinawa, as they are traditional Ryukyuan (indigenous to Okinawa) decorations. Shisa usually come in pairs, one with an open mouth and one with a closed mouth, and someone once told me that this represents the circle of life through the Japanese alphabet. 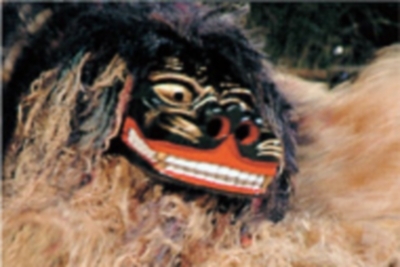 The open mouth represents あ (a) and the closed mouth represents ん (n). To make あ you need to open your mouth, and to make ん you need to have your mouth closed. あ and ん are the first and last letters in the Japanese alphabet (I’m not sure if ‘alphabet’ is really the right word, but I mean the set of hiragana or katakana). 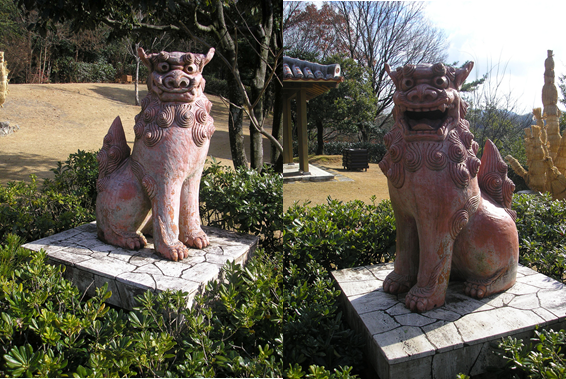 The pair of animals, which are sort of a cross between a lion and a dog (from Okinawan mythology) are said to ward off evil and are often placed at entrances and on roofs. There are various theories about the open and closed mouths keeping good spirits in and scaring away bad spirits on Wikipedia, but I’m not sure which theories are most commonly believed. Apparently some people also believe that the closed-mouthed shisa is female and the open-mouthed shisa is male. When a Chinese emissary returned from a voyage to the court at Shuri Castle, he brought a gift for the king, a necklace decorated with a figurine of a shisa-dog. The king found it charming and wore it underneath his clothes. At the Naha Port bay, the village of Madanbashi was often terrorized by a sea dragon who ate the villagers and destroyed their property. One day, the king was visiting the village, and one of these attacks happened; all the people ran and hid. The local noro had been told in a dream to instruct the king when he visited to stand on the beach and lift up his figurine towards the dragon; she sent the boy, Chiga, to tell him the message. He faced the monster with the figurine held high, and immediately a giant roar sounded all through the village, a roar so deep and powerful that it even shook the dragon. A massive boulder then fell from heaven and crushed the dragon’s tail. He couldn’t move, and eventually died. This boulder and the dragon’s body became covered with plants and surrounded by trees, and can still be seen today. It is the “Gana-mui Woods” near Naha Ohashi bridge. 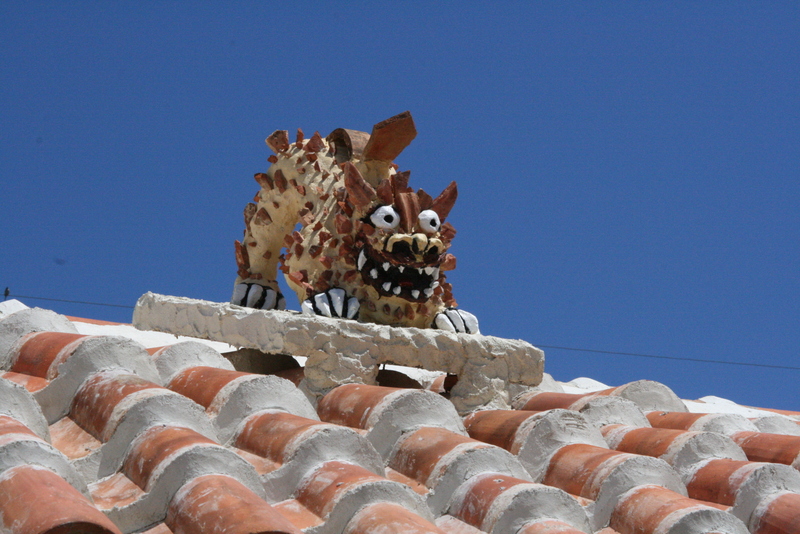 The townspeople built a large stone shisa to protect it from the dragon’s spirit and other threats. You might have noticed that shisa look very similar to the Chinese lions which we often see dancing at New Year’s celebrations. Well, they are similar, but apparently their movements are quite different. In Okinawa ‘shishimai’ (lion dance) festivals are held, and there are many variations even just throughout the Okinawan islands. I’ve not been able to find much information about these festivals, but I believe they usually happen around September/October (although I’ve also found mentions of them happening at New Year and in the spring). The dance is supposed to ward off evil spirits and summon the god of harvest and wealth, according to Okinawa Story, and it is often accompanied by the sanshin – a banjo-like instrument. If you visit Okinawa you’re bound to encounter lots of shisa souvenirs. I’ve never been to Okinawa, so I wouldn’t know the best kind of souvenirs to buy, but luckily Okinawa Hai! 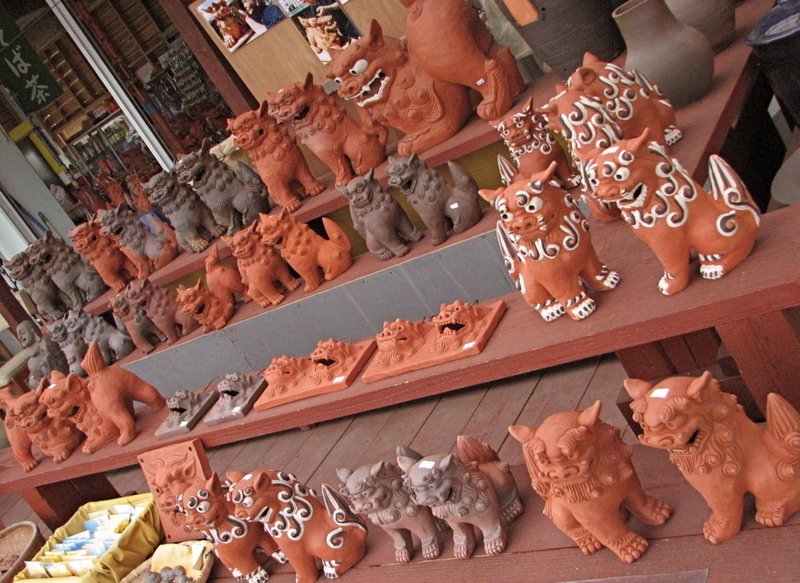 has some great suggestions – in Yachimun no Sato in Yomitan Village you can buy cute pottery shisa like the ones below. I realized that when I saw what the others suggested. I guess I’m already too Japanese in my thinking. Yeah, shisa is written シーサー, so it has a long ‘a’ at the end. 😉 Thanks for the new suggestions!